I like Canberra. I never used to but it has grown on me over the years. I still have no idea how to get to anywhere except Mt. Stromlo but I’m getting there. I don’t often get down there in Summer and I am not so sure those scorching hot dry days would suit me so well but, being a winter person, the cold blustery days suit me just fine. I awoke to a thick frost covering the car. The chill made it hard to get up. It was the final round of the Shimano GP series though and I have been shooting this series for a few years now. 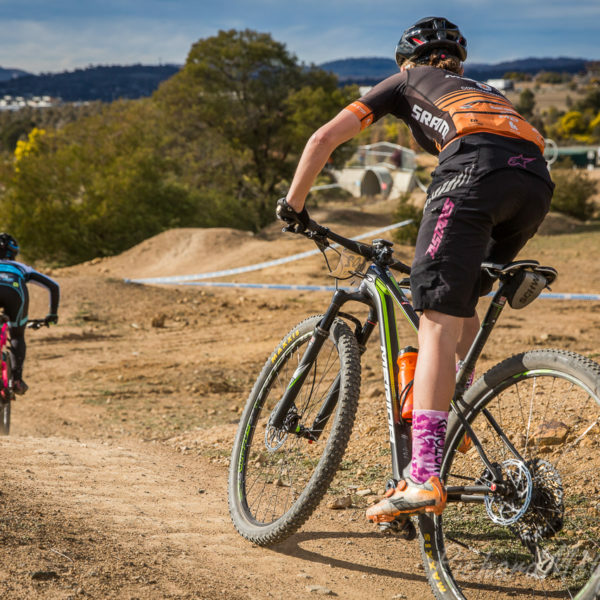 Stromlo is one of my favourites on the circuit there are some great views to be had around the hill. A couple of hundred people turned out for the race. I got out onto a new section of track on the backside called slippery rock. Although i say new the track itself is old but its new to the race and new for me to shoot. I made my way upward shooting at various locations along the way. At the top of the section I was greeted with a great open vista across to the Brindabella range to the west. Day dawned warmer but soon cooled off as a cold wind set in. Today it was the Elite Sprint Cup, a new race for, as the name suggests, some of the top names in the Australian XC racing scene. The course was only 2kms long and as I was here to shoot editorials rather than competitor shots I found myself running around a lot more trying to cram in as many shots and locations as I could in the short time. Thankfully it was a nice compact track. One of the things I love about Canberra at this time is the golden blooms of wattle And this short course ran straight through one of the finest stands of wattle trees at Stromlo. It also ran across the 4 cross track and so I found myself running between the 2 sections each lap. It was great to see the impressive pace these athletes all kept up. Last weekend was spent cavorting around the headlands and bushland near Kempsey. It was the final round of Rocky Trail Entertainment’s Fox Superflow Enduro and I was up there to cover it with Gil under the guise of Outer Image. I set up camp each night at the beautiful Hat Head National Park on the coast. It’s only about a 20 minute drive from the trails in Kempsey but is a beautiful area. Rugged coastline and wild surf made for some interesting shooting on the headlands over the weekend. Kempsey Superflow enduro is a 2 day race taking place on Saturday afternoon and Sunday morning. The trails had been hit by some torrential rain through the week leading up to the race. Sections of the tracks were underwater whilst other sections were just mudpits. It certainly made for some interesting comments from the riders as they went on by. On the Sunday the trails were cut shorter in order to remove the worst of the wet trails. There was still a couple of deep mud sections that took down more than a few riders. On the way home I took a bit of a detour and headed out to find Mount Seaview Nature Reserve. in the falling darkness I managed to drive right past the turnoff. Not wanting to drive too much further in the dark (I would miss all the great scenery) I settled in for the night on the edge of Cottan Bimbang National Park. In the morning I took a drive through the park and it is definitely a place that I think calls for some further exploring. I headed back towards Mt. Seaview but it turns out it’s not an easy park to access. Something I shall have to plan for in the coming future. A spur of the moment trip to Canberra to go shoot at the National Round of the Downhill saw me paying a visit to the nearby Brindabella range. I have visited these mountains a few times now but still think I am only scratching the surface of what they have to offer. I arrived late in the afternoon and spent the night at the top of Mt Ginini which was as far in as I could drive. Thankfully I had been unable to find my summer sleeping bag and had taken my warm on as the temperature dropped to 3C despite the fact that it was mid-summer. In the morning I rose to being enveloped in the clouds so there wasn’t any real sign of sunrise. I spent the best part of the morning driving around and enjoying the beautiful scenery. I stopped off at Mt. Franklin and walked to the site of Australia’s first ski lodge. I could quite happily have spent the whole weekends drifting around in the hills. Although I missed most of the practice runs of the National series downhill i made it down for the main event. As is normal for Stromlo someone seemed to have turned the thermostat up. The action was great with a lot of Australia’s best racers screaming down the hill. A friendly local of the Brindabella range. A flame Robin of the Brindabella range. I had a weekend free of sorts so I took a trip to Canberra. I had donated a print to the charity Pedal 4 Pierce for their upcoming auction at Fight night.The framers had insisted that I come down and sign the print before they finish the frame. I had also been wanting to do a shoot with Chris Jefferys, the founder of Pedal 4 Pierce, outside of a race setting like we had always done until this point so that they had a selection of images to use for promotional purposes. So I guess a little bit of background is in order here first for those that don’t know. Pedal 4 Pierce was a charity started by Chris when he was 10 years old. Chris decided he wanted to ride bikes but do so in order to raise money for research into a worthy cause. He chose muscular dystrophy as his focus and Pedal 4 Pierce was born. He has been at it for the last 7 years or so. If you get a chance swing on over to their website and /or Facebook page and throw some support behind them. I also asked a outlet of talented dirt jumpers, Jack Baker and Tom Wrigley, to join me for a day shooting down there on some of the local trails that we knew about.The jumps are made from an orange dirt that contrast beautifully with the green of the surrounding vegetation. They had been extended quite a bit since I last shot down there so there was plenty of fresh angle to shoot from. I also managed to squeeze in a quick shoot for Copic Australia. They brought along one of their new bikes that they had just finished building up, plenty of being on the bike. It was a full steel frame but super light. Keep an eye out for it on the enduro trails. The other reason for the trip was just to have a better look around Canberra and it’s surrounds. I was never too enamored with Canberra before but every time I go down there it grows on me a little bit more. So I drove out into the Brindabella National Park where things were nice and frosty and did a little exploring. There is definitely a lot more exploring needed in this area. I am back down in Canberra next weekend so I shall continue with my exploration then. I needed to test a little piece of software so I thought I should put up a few landscape images from a recent trip to the Snowy Mountains for your enjoyment.